Two women have gone on trial in Morocco on charges of "gross indecency" for wearing skirts. The two were arrested in Inezgane last month, after a market trader drew attention to what they were wearing and a crowd gathered round, reports say. An internet petition calling the arrest an attack on personal freedom has attracted thousands of signatures. There was controversy in May when a Jennifer Lopez performance in Morocco was considered "sexually suggestive". There have been a number of demonstrations over the case in Morocco, with protesters saying that women should be free to wear what they want. 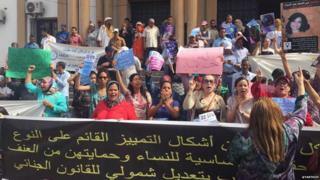 Activists also gathered at the court house on Monday to support the detainees. The two women, 23 and 29, are being tried under an article in the penal code which says that anyone found guilty of committing an act of "public obscenity" can be jailed for up to two years. The judge will give a verdict on 13 July.